Moms have a habit of saying they don’t really want or need anything for Mother’s Day, or their birthday, or any other holiday that celebrates them. But we have a feeling there’s at least one thing on this list that your mom will love. From pillows to nameplates to art, find something for the special woman in your life. Because it’s the truth and she’ll feel so official with this sitting on her desk. This wreath will naturally dry, leaving your mom with an entire wreath’s worth of herbs she can use for cooking all year long. And it’s lovely to look at! 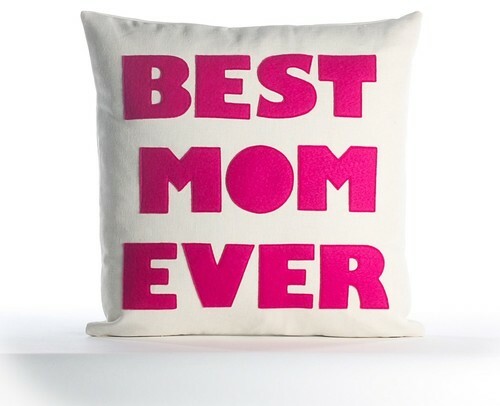 This pillow is sweet, just like your mom. She’ll love having a new pillow to add to her couch collection. Her coffee will thank you for these cute and colorful DIY edible spoons that add flavor to any hot beverage. A good bath is one of the most relaxing things in the world, especially when using naturally scented organic products. Everything, including the reusable box this set comes in, is made using only natural ingredients. Bathtime Gift Set via The Honest Co.
Everyone knows when mom’s not happy, nobody’s happy. Get her some art that lets her know you know she’s the boss. This bag folds up to a size she can toss in her purse and can hold up to 50 pounds of stuff. She’ll never have to worry about leaving her grocery bag in the car again. Who doesn’t love a cozy sweatshirt, especially one with a sense of humor? Every month, your mom gets to pick a different book to receive from a panel of judges in the Book of the Month club and join in online discussions (if she wants) for free. It’s a gift she’ll enjoy all year long.